Includes 54 top quality aromas and index cards. Booklet about correlation between taste and smell included. Includes 6 major aromas found in wine. Includes 12 basic aromas found in red wines & a booklet on wine tasting and the sense of smell. Made from 100% Portuguese cork. Designed with tiny blemishes, lending an ancient charm. 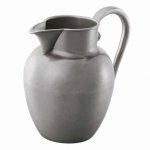 Royal Selangor's Palladio Collection Pewter Pitcher. Comes designed with an antique-finish. Award winning wine writer Natalie MacLean takes readers on a wine journey once again with her second creative wine book. Relive her exotic travels as she searches for the world's greatest value wines. Spray, Soak and Rub Away! Large - 12 oz Bottle. Wine Away, wine stain removal works great on fabrics including table linens, clothing and carpeting. Wine Away is bleach-free and biodegradable. Small Bottle - Wine Out Red Wine Stain Remover works great on table linens, clothing and carpets to help remove many everyday stains. Serve and Preserve your wine with Wine Art! 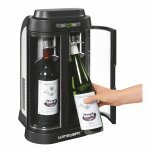 Keeps your wine fresh for up to 10 days and ensures you serve it at the correct temperature! 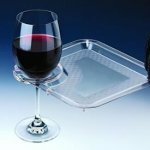 Holds snacks and your wine glass! Wine Book by Natalie MacLean - Natalie's first novel looks at the multinational world of wine and visits with the most charismatic personalities. The really large Taster Wine Glass is hand crystal blown. Taster glass is large enough to hold a full 750ml bottle of wine (31oz). Leather pouch holder for waiter’s style corkscrew with belt clip.